Everyone feels sad sometimes. For some people, however, sadness can grow into a debilitating medical condition known as depression, or major depressive disorder (MDD). MDD is quite prevalent, affecting approximately 20 percent of people at some point in their lifetime, and has been linked to other physiological complications, such as increased risk of cardiovascular disease, dyslipidemia, diabetes and hypertension. Increase in oxidative stress in MDD patients has also been reported. Overall, MDD patients have been shown to have decreased lifespan and quality of life. Vitamin D is a fat-soluble secosteroid (a steroid with an “open” ring) that enhances absorption of essential elements, such as magnesium, iron, calcium, phosphate, and zinc. Traditionally, the majority of vitamin D has been obtained from exposure to sunlight. It is also available through dietary consumption, mostly through fortified foods like milk and cereal. Vitamin D obtained from sunlight or diet requires hydroxylation (addition of a hydroxyl “–OH” group) in the liver to become biologically active. There are two major forms of vitamin D: D2 (ergocalciferol, obtained from foods) and D3 (cholecalciferol, synthesized following exposure to sunlight). Collectively, both isoforms are termed calciferol. Calciferol is converted into calcidiol, a parahormone, in the liver, and subsequently converted into the biologically active form calcitriol in the kidneys. Calcitriol binds the nuclear vitamin D receptor, which is ubiquitously expressed, inducing transcription of various target genes. Vitamin D plays an important role in proper bone formation and maintenance of bone density, along with a possible role in the immune system. Vitamin D deficiency has been associated with a variety of diseases, including osteoporosis, neurodegenerative diseases, cardiovascular disease, and complications during pregnancy. Serum vitamin D levels have also been negatively correlated with depressive symptoms. Recent meta-analyses have shown a connection between higher serum vitamin D levels and improved depressive symptoms in people with MDD. There are also a number of studies on the effects of various levels of vitamin D supplementation in MDD patients. Some studies suggest no benefits of vitamin D to mood symptoms of MDD; however, a meta-analysis of existing studies concluded that vitamin D supplementation of 800IU per day or more in vitamin D deficient patients has a positive impact on MDD mood symptoms. In addition to a positive effect on mood, vitamin D supplementation has been shown to have a positive effect on glucose and cholesterol levels in pregnant women with gestational diabetes (high blood sugar during pregnancy). Recent meta-analyses have indicated that type 2 diabetes is significantly more common in MDD patients, and markers of oxidative stress are elevated in MDD patients. Since the researchers behind the current study have recently shown that high-dose vitamin D supplementation improves glucose levels, oxidative stress and inflammation in type 2 diabetes patients, in this study they wanted to investigate the effect of vitamin D supplementation on oxidative stress and blood glucose in MDD patients, as well as the effect on mood change. Vitamin D supplementation has been shown to be beneficial in studies on depression and metabolic disorders; however, no studies have investigated effects of vitamin D supplementation on both mood and metabolic markers in a population of MDD patients. This study was designed to investigate the benefits of high-dose 8-week vitamin D supplementation in MDD patients. Researchers conducted a randomized, placebo-controlled, double-blind study on MDD patients 18–65 years of age living in Kashan, Iran. They used the Hamilton Depression Rating Scale (HDRS) to measure participants’ level of depression at study recruitment. Those with a score of at least 15 on the standard HDRS, which corresponds to at least mild depression, were included in the current study. Patients were excluded if they had a history of liver and cardiac diseases, were pregnant or lactating women, were smokers or substance abuses, or took dietary supplements during the last two months. Figure 1 summarizes the study design. Participants were then randomly assigned to take either a capsule of 50 kIU (50,000 IU) of vitamin D or a placebo pill once a week for eight weeks. Both the experimental and the control groups consisted of 17 women and one man each. To measure changes in biochemical parameters, fasting blood samples were collected from participants at the beginning and end of the study. They measured plasma levels of 25-hydroxyvitamin D levels (a measure of stored vitamin D) and insulin as well as C-reactive protein (hs-CRP, a marker of inflammation) using enzyme-linked immunosorbent assay (ELISA). Other measurements included glucose, triglycerides, calcium, cholesterol, lipoproteins, and antioxidant capacity. Homeostatic model of insulin resistance (HOMA-IR) and beta cell function (HOMA-B), as well as quantitative insulin sensitivity check index (QUICKI), were estimated using measured values for fasting serum glucose and fasting insulin according to published formulas. The HOMA formulas were developed from physiological data on glucose and insulin levels, and are often used in diabetes research to determine the relative degree of impairment in insulin resistance or beta cell function. The QUICKI is a simplified version of the HOMA that was designed to be implemented in large-scale studies. ELISA is used to measure the concentration of one or more proteins in a sample. Its basic steps are outlined in Figure 2. There are three main types of ELISA assays, which vary based on detection method: direct, indirect and sandwich. During direct ELISA, the simplest form of the assay, the protein of interest is immobilized onto a microwell plate. The plate is incubated with solution(s) containing antibody that will bind to the protein of interest. The antibody is conjugated to an enzyme (such as horseradish peroxidase (HRP)), and substrate for this enzyme is added to the wells. The enzyme cleaves the substrate, producing a visible color signal that can be detected in a microplate reader. The amount of signal is proportional to the amount of protein present in the well. 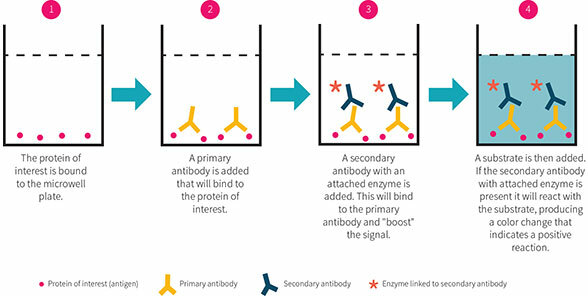 Direct ELISA uses a single antibody for the protein, whereas indirect and sandwich ELISAs use an antibody for the protein followed by a secondary antibody to amplify the signal. Known amounts of protein are incubated alongside unknown samples to build a standard curve from which the amounts of protein are calculated. To assess changes in participants’ MDD symptoms, researchers used the Beck Depression Inventory (BDI). Like HDRS, BDI is a questionnaire composed of 21 questions that measure a variety of depressive symptoms, such as mood, suicidal ideations, and changes in weight. The answer to each question is rated on a scale from zero to three, with the higher value indicating more severe symptoms. Therefore, an increase in BDI score would indicate worsening MDD symptoms. Iranian men and women who were 18-65 years old and diagnosed with moderate MDD were given 50,000 IU Vitamin D or placebo for 8 weeks. Researchers measured changes in markers of insulin functioning and redox status by collecting plasma from the participants. Researchers also assessed nutritional intake and exercise throughout the study through self-reported questionnaires. Lastly, researchers also tracked changes in participants’ mood using a self-reported depressive inventory. Both experimental and control groups were deficient in vitamin D at baseline, and serum levels of 25-hydroxyvitamin D (vitamin D) were significantly higher in the experimental group (13.6ug/L) compared to placebo group (9.2 ug/L) at beginning of the study. In order to control for any effects of the elevated vitamin D levels at baseline, researchers controlled for baseline values, age and baseline BMI. Figure 3 shows the main study results. Vitamin D supplementation increased circulating 25-hydroxyvitamin D by 250 percent in the experimental group only. Researchers noted improved BDI scores in the vitamin D group. BDI scores in the vitamin D group decreased by 32 percent (indicating improvement in depressive symptoms), whereas only a slight decrease was noted in the control group. The difference in the decrease between the two groups was not quite statistically significant (p=0.06), although it became significant when researchers corrected for baseline 25-hydroxyvitamin D levels, as well as baseline BMI and age (p=0.04). There were also significant differences in the changes in metabolic parameters between the two groups. Serum insulin concentrations significantly improved by 28 percent in the vitamin D group compared to no change in control group. The homeostatic model assessment of insulin resistance (HOMA-IR) significantly decreased by 36 percent in the experimental group, while slightly worsening in the placebo group. This indicates that, at least using mathematical modeling, MDD patients supplemented with vitamin D have decreased insulin resistance. The redox profile also improved in the vitamin D group compared to placebo controls. Total antioxidant capacity significantly improved, although only by 7 percent, compared to a lesser, insignificant improvement of 3 percent in the control group. Glutathione concentrations significantly increased in the vitamin D group by 24 percent, but decreased by 28 percent in the control group. Eight weeks of high-dose vitamin D supplementation in MDD patients may improve their depressive symptoms. It also improved a variety of metabolic measures, decreased their fasting serum insulin levels, improving insulin resistance and beta cell function, increasing their antioxidant capacity and elevating serum glutathione levels. This study adds to growing evidence showing that vitamin D supplementation improves depressive symptoms in MDD patients. Serum levels of 25-hydroxyvitamin D have been shown to negatively correlate with depressive symptoms in MDD patients. In the current study, eight weeks of supplementation with 50,000IU vitamin D per week resulted in possibly improved (decreased) BDI score, ameliorating participants’ depression diagnosis from moderate to mild depression. The dose in this study amounts to 7,143 IU vitamin D per day. The researchers interpreted their data to indicate that vitamin D supplementation improves patients’ depressive mood. However, the differences seen in the vitamin D group did not become significantly different until researchers controlled for a variety of variables (baseline 25-hydroxyvitamin D levels, BMI and age). As researchers reported no difference in baseline BMI or age between the experimental and control groups, it is unclear why controlling for these parameters would alter significance of changes in BDI scores. Therefore, study conclusions regarding impact of vitamin D supplementation on mood symptoms in MDD should be taken with a grain of salt. Moreover, the BDI does not determine whether reported symptoms are due to MDD or other illnesses. So theoretically, vitamin D supplementation may have improved energy levels in MDD patients independent of improving mood per se; however, this would be measured as improved MDD symptom on the BDI measures. In this study, researchers used two different measures of MDD symptoms, the HDRS (at the recruitment stage) and BDI (to measure changes in depressive symptoms throughout the study). It is unclear as to why the researchers switched to a different measuring tool in the study. Some argue that the two scales measure different aspects of MDD treatment, with HDRS measuring medication effects and BDI assessing psychotherapy outcomes. Since researchers measured the effects of medication on depressive symptoms, they might have benefited from using HDRS for the entire study. MDD has been linked with diabetes and insulin resistance. In this study, vitamin D supplementation improved insulin levels along with predicted insulin resistance and beta cell function. It is unclear exactly how vitamin D affects insulin metabolism specifically. Insulin is secreted into the blood to help promote glucose absorption. Vitamin D has been shown to increase levels of the glucose transporter GLUT4 and improve glucose metabolism in cultured adipocytes (fat cells), and GLUT3 expression in diabetic rats. This may increase glucose absorption and consequently decrease blood insulin levels. Vitamin D could exert other effects on insulin metabolism that have yet to be discovered. This study does not clarify whether positive effects of vitamin D occur once patients reach a threshold value (threshold model), or whether positive effects of vitamin D supplementation are proportional to vitamin D levels post-threshold (dose-dependent model). In this study, vitamin D appeared to improve mood, which may be due to increased neurotransmitter synthesis. Vitamin D also appears to improve insulin functioning, though the exact mechanism is unknown. MDD is a debilitating disease that affects many people worldwide. It is associated with decreased life expectancy and poor quality of life. Improved treatments for this condition are needed. There has been an accumulation of evidence for the beneficial role of vitamin D in MDD. This study shows that high-dose vitamin D supplementation possibly promotes improvement in depressive symptoms. However, high doses of vitamin D may have harmful side effects. A study in seniors showed an increase in falls in the groups that received 24,000 IU or 40,000 IU once a month. This suggests that it may be wise to accurately assess vitamin D side effects in MDD patients as well, especially in trials using large doses of vitamin D.
This study highlights the need to correct an existing vitamin D deficiency if there is one, as the patient population was largely vitamin D deficient at baseline. Insulin and mood benefits were only observed when participants reached sufficient serum vitamin D levels. Further studies of vitamin D effects on MDD in other patient populations, including those with replete serum vitamin D levels, are needed before vitamin D can be used as a reliable treatment for MDD. The molecular mechanism by which vitamin D could influence mood is unclear. Vitamin D supplementation has been shown to increase expression of receptors for dopamine and norepinephrine in diabetic rats, which might contribute to elevated mood through increased neurotransmitter signaling. Vitamin D has also been shown to increase levels of tyrosine hydroxylase, an enzyme responsible for the synthesis of dopamine and other catecholamine neurotransmitters. However, vitamin D may exert beneficial effects on mood through other mechanisms as well. Are there any dangers to taking vitamin D supplements? As vitamin D deficiency is very prevalent, it is generally a good idea to take a vitamin D supplement if you’re unable to get enough sunlight. However, beware of high-dose vitamin D supplementation, as high serum levels of vitamin D can cause a dangerous rise in blood calcium levels (hypercalcemia). Taking vitamin K2 alongside vitamin D may help prevent calcium spikes. And given the aforementioned potential of high dose vitamin D to cause increased falls in the elderly, it may be best to avoid weekly/monthly/yearly high doses if more regular smaller doses are feasible. Should I pop vitamin pills, or go for the sunshine route? First of all, these options are not mutually exclusive. Opting for supplementation in the winter and sunshine in other seasons is a common strategy. Second, it’s been suggested by several studies in different populations that sunshine has a greater effect on mood than does vitamin D alone. That makes intuitive sense, as you get vitamin D benefits in addition to other benefits such as increased endorphin production. MDD has been linked with increased insulin resistance, and vitamin D has been shown to improve insulin resistance parameters. In this study, researchers administered high doses of vitamin D to patients with moderately severe MDD weekly for eight weeks, and found an improvement in insulin resistance parameters and possible depressive mood scores. This study highlights the need to further investigate vitamin D as a potential therapeutic for people with MDD, with a focus on dose needed to achieve an effect as well as potential side effects in this specific population. Reproduced with permission from Examine.com. All rights reserved.